Metal boxes, gorgeous tins, jewelry boxes, they are everywhere. You see lots of them with flower designs these days. 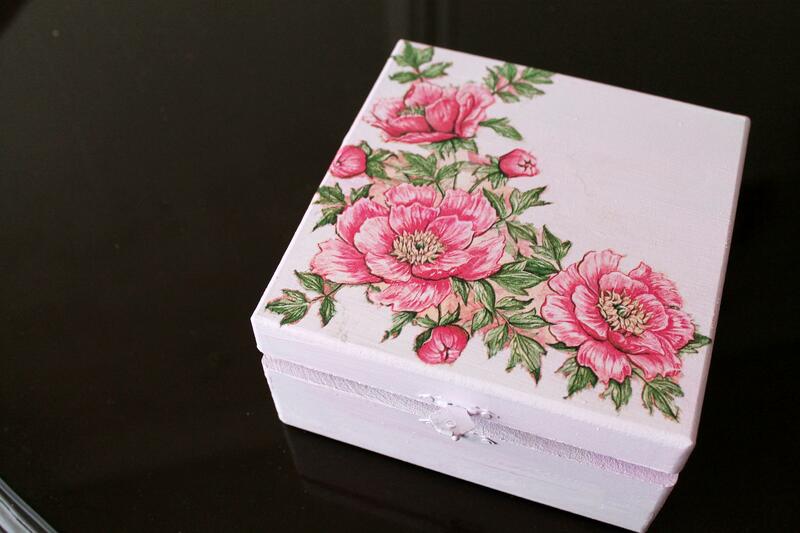 “Shabby chic” is in, and with it comes the love for light blue, pink, and flowery boxes. Flowers have been present in Persian paintings and designs for a very, very long time. And these gorgeous boxes remind me of them. You know, they are actually not that hard to make. In fact, I am going to teach you how to build one. It’s so simple, a piece of cake, and the result looks just adorable!! And guess what, this is a green & eco-friendly DIY, you can recycle that old wooden box you’ve had around for ages, or the one with ugly paintings, or the nostalgic one that belonged to your grandma!! Yay to recycling! I’m so excited to share this with you! So enough from me, go down and check out the tutorial for this eco-friendly DIY yourself!